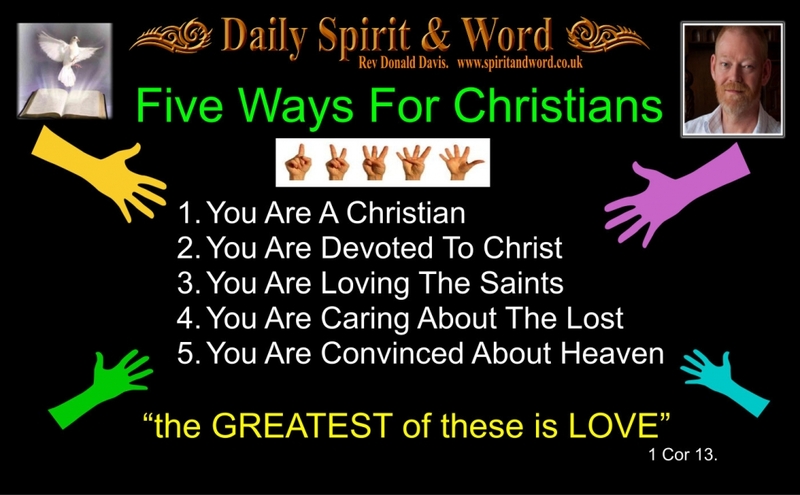 452: Five Ways For Christians To Be Remembered. Good morning my friends, don’t you just love Friday’s? It marks the end of the working week and the prospect of a day of rest for most. I know there are many who don’t enjoy the luxury of a day off and I even know a few who work seven days a week. However, there are good reasons for taking a day off and having a good rest from your normal labours. The principal one being, we don’t want to drive ourselves into an early grave by being overworked, overstressed. There are also many good reasons; reconnecting relationships with loved ones and with brothers and sisters in the faith and also taking time out to worship the Lord. Over the years since becoming a follower of Jesus, I remember with fondness many brothers and sisters who’ve died and gone to be with Him. What is it about them that warms my heart today? Their love for the Lord, their devotion to the things of God and their love and warmth for all people; Christians and non-Christians. When its your turn to leave this earth and go home to glory, you’ll be remembered by your friends and family, but what will they remember you for? Think about Jesus; because Christians are being transformed daily into the likeness of Christ. What was Jesus remembered for? His complete obedience, even to death upon the cross. His powerful miracles and the fact that He didn’t charge people but healed them freely. His attitude to those on the margins of society, sinners and social rejects, Jesus took time to be with them and was scandalised for it. His ways with people from all walks of life; rich and poor, men and women, old and infant. Most of all we probably remember Jesus for His LOVE, CARE, MESSAGE OF TRUTH, AND DEDICATION TO THE FATHER’S WILL. Here are some things every follower of Jesus should strive for and become TOP priorities in our lives. What a Christian is? Someone who’s Trusted in Jesus death for their sins upon the Cross, who’s believed in Jesus, who’s repented of their sins and forsaken them, who’s been born again of God’s Holy Spirit, who knows Jesus as Lord and Saviour, who’s a committed member of a local fellowship of Saints and is serving the Lord with their gifts and talents and who gives wholeheartedly to the fellowship. How to become a Christian? Believe in Jesus, Repent of sin and Receive Him as Lord: Then you will be born of the Spirit. What it means to be a Christian? You’ll love God, love the saints and love those who don’t yet know Jesus as Lord. You’ll be filled with His compassion for others, meeting their needs and serving with your life. The Foundation of Your Dedication: Love, obedience, praise and devotion for Jesus. The Character of Your Dedication: voluntary, wholehearted, sacrificial, practical, disciplined. The Results of Your Dedication: Known to be Blessed by the Lord, loved by the saints and sinners. (See 37 List at bottom of page). “by your LOVE for one another, people will know you belong to Christ”. Your Obedience to the Lord’s Commands: Matthew 28:18-20; Acts 1:8; Mark 16:15-20. You’ll Cry For Their Predicament: Luke 16:19-28 (The Rich Man and Lazarus). You’ll be Guided by the Holy Spirit: Acts 16:6-9. Your Zeal to reach out: Acts 2; 1 Cor 9:16 (How horrible it is when I don’t reach-out to others and preach the Gospel). You DESIRE Jesus to either come or be with Him forever. Your FOCUS is upon the Blessings when He Comes. You LIVE your whole life; preapered for His coming or your going Home. You KNOW this earth is NOT your home. There are probably many, many more, but as you are transformed into the Likeness of Jesus daily, you can’t help but become more powerful, prayerful, practical, resourceful, holy and full of love for God, for brothers and sisters in the faith and for those who don’t yet know Jesus Christ as Lord. How will you be remembered when you leave the earth? Don’t worry what others think about you, but think of the eternal rewards you are storing up in Heaven as you serve the Lord Jesus today. Have an awesome weekend my friends, I’m really looking forward to gathering with my brothers and sisters again on Sunday to praise ans worship the Lord Jesus in the power of the Holy Spirit. Wherever you are my prayers are with you. Stay blessed and walk closely with Jesus today. Don’t forget to PRAISE Him, Love Him and you’ll be full of His Love for others too. Here are 37 ways Christians can LOVE one another. Can also be read at St Luke’s Church Facebook Page. Five Way To Be Remembered.